An ambitious double appointment of experienced Corporate Sales Managers to our existing Business Development Team is hoped to drive further revenue growth at one of Edinburgh’s most historic venues. 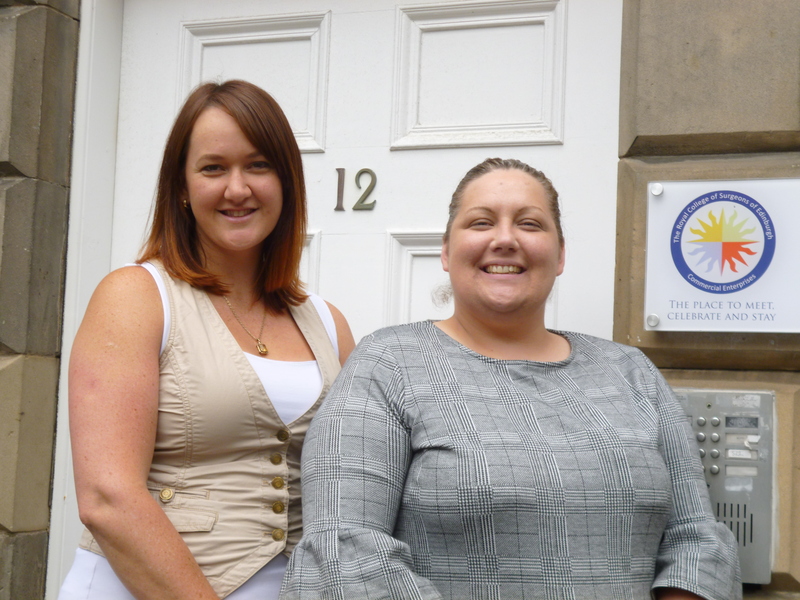 With a combined total of 24 years’ experience in the hospitality industry, Katie Heigh and Elizabeth Squair, join the commercial arm of the Royal College of Surgeons of Edinburgh (RCSEd). In their new roles, Katie and Elizabeth have been tasked with securing new sales opportunities, as well as ensuring sustained corporate demand across RCSEd’s four iconic buildings, as well as the successful Ten Hill Place Hotel, Café 1505, No.10 Restaurant and 10 Wine Bar. Joining from her previous post as Sales and Marketing Manager at G1 Group, Katie was responsible for creating sales and marketing plans for The Murrayfield House Hotel and Inn on the Mile. Bringing her wealth of knowledge of the Scottish capital, the hospitality industry and contacts, Katie is looking forward to growing in the team and adding to the work of the charitable organisation. Katie, who has 15 years experience in the industry, said: “It is a really exciting time to join RCSEd Commercial Enterprises, the company has transformed since its launch little over ten years ago and will provide so many opportunities for me to expand my knowledge and abilities. Recruited from her post as Business Development Executive at the Edinburgh Corn Exchange, Elizabeth, who is originally from Zimbabwe, has key skills across the hospitality and events market and will be putting them to use in her new role. Elizabeth, said: “The team here are lovely and so supportive, the company is really interesting and I can’t wait to get stuck right in. There is so much growth and development happening right now. Scott Mitchell, Commercial Director at Surgeon’s Hall, said: “Both Katie and Elizabeth have a wealth of experience working in the industry and bring a diverse and valuable sets of skills to our growing teams. They are an ideal fit and we are delighted to have them working with us. The stunning Prince Phillip building opened in 2015 following the transformation of a former Edinburgh University language school and the modern Quincentenary Conference Centre was created in 2005 to celebrate the institution’s 500th anniversary. Launched in 2006, the Commercial Enterprises team promotes, sells and manages conferences, corporate events, weddings and other events across the College’s buildings. It has also helped establish the College as a Festival-Fringe venue and last August hosted seven theatres frequented by 75,000 customers, while also delivering significant food and beverage sales through its partnership with Edinburgh based Heritage Portfolio. The Royal College of Surgeons of Edinburgh is one of the world’s oldest medical institutions founded in 1505 after receiving a Royal Seal of Cause from King James IV. All proceeds made by Commercial Enterprises support the charitable aims of the College which are education, assessment and advancement in surgery.